Do you have great posts and pages that just won’t rank in Google’s search results? Even the greatest content won’t rank unless you take care of good keyword optimization of your pages. In this blog posts, we will show you how to do exactly that! So, read along, get valuable on-page SEO tips, and learn how to optimize your page content for your keywords. Good news: We created a service that does all of this for you. Simply name us your ten most important or most interesting pages/posts. We will optimize these pages for you according to up-to-date SEO best practice standards – within just two working days! Note: We use the Yoast SEO WordPress plugin to do on-page keyword optimization. If you don’t yet have this plugin installed on your WordPress backend, take a look at our Yoast SEO Setup Service or read our blog post and learn how to do it yourself. Are you still new to the world of SEO? Find below explanations of some of the terms used throughout this post. SERP stands for “Search Engine Results Page”, meaning the list of pages you see when you enter something into Google’s search bar and hit enter. One usually contains ten organic search results. The goal of SEO is to rank on (top of) the first SERP of Google. Keywords are the search queries that people put into a search engine to look for specific content. In order to rank organically in Google, you have to optimize your pages according to these keywords. In essence, you need to understand what your potential visitors intend to find – and then deliver exactly that with your content. Note: Although we talk about the singular “keyword” in SEO, a keyword can be made up of more than one word. For example, “cars”, “electric cars” or “car repair in london” would all be considered a keyword in SEO terms. The title tag specifies a page’s title. On SERPs, most of the times the title tag will be shown as the clickable link to that page. The meta description is a short summary of that page’s content, and as with the title tag, in most cases it will be displayed in the SERPs. 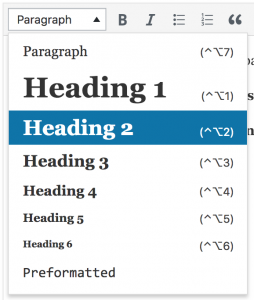 You use header tags to specify the title and subtitles of your pages. Usually, the H1 tag will be the title of a page, while H2, H3, … will be used to define any subheadings. The alt tag (a common abbreviation of the alt attribute of an image tag) is used to describe contents of images. It will be displayed when an image cannot be loaded or it is used by screen readers for the visually impaired. The Yoast SEO plugin the most comprehensive SEO plugin for WordPress on the market right now. It analyzes your posts/pages and gives you various options and recommendations to optimize your website and your content for search engines. Note: For reasons of readability, whenever we talk about a page from this point forward, we simultaneously mean post as well – all the principles and optimization steps can of course be applied to both. 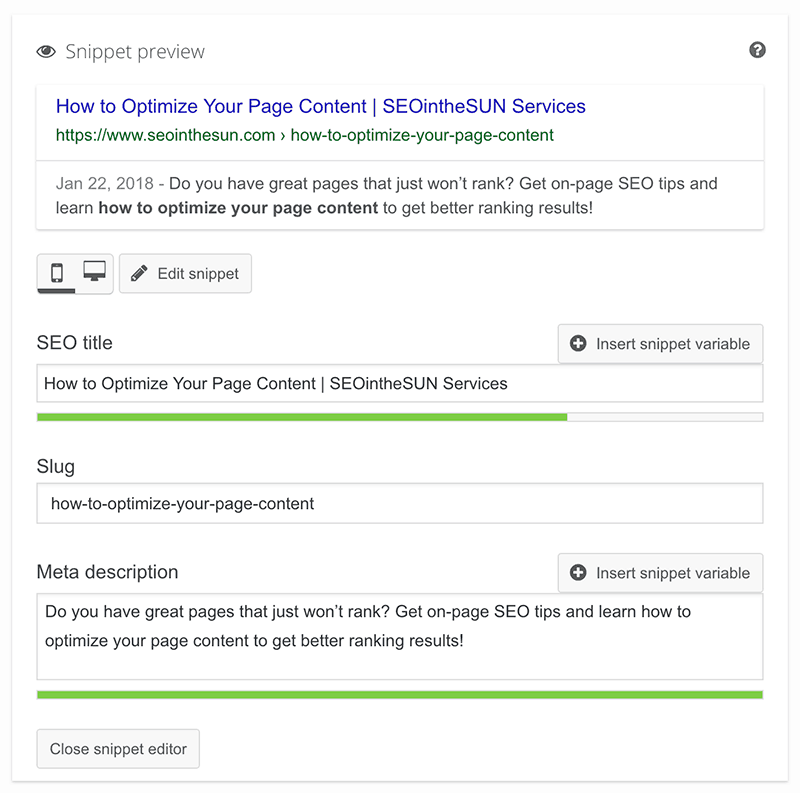 We divided the process of optimizing a page into 5 steps: Meta Title and Description, URL, Keyword and Text Structure, Header Tags, and Alt Tags. While nowadays only the title and your text content are the absolute crucial parts where you want to include your keywords, the other page elements we’ll be talking about are still “nice to have” and might give you a ranking boost. Use the links below to quickly jump to one of the steps. First, you want to make sure your meta title and description are optimized for your keywords. Go into edit mode of the page that you want to optimize. That means, on your WordPress backend, go to Pages → All Pages and click on Edit of the page that you want to optimize. Scroll down to the Yoast SEO options of your page. Enter the focus keyword for your page into the appropriate box. Are you not sure about the right keyword(s) for your pages? Now is high time to do a keyword research! Check out our Keyword Ranking Report service or our blog post. With it, you can directly see what keywords your pages already rank for. This will give you a good basis for choosing the right focus keyword(s) or to conduct further keyword research. Next, click on Edit snippet. Here you can alter the meta title and description of your page. With a maximum of 60-70 characters, think of a promising title that matches your page’s content. Make sure that your title starts with your focus keyword – if that’s not possible, it should at least contain your keyword somewhere. Remember to keep it short and simple. Describe your page’s content with a maximum of around 150 characters. Use active voice and make it actionable, ergo: trigger a click! Include your target keyword here, but try not to sound too repetitive or forced. Your description should match the post and represent the real content. Now that you’ve updated your title and description, hit Update and you’re all set. Google doesn’t only use your meta info or your content, it also uses the URL to categorize and rank your page. As a rule of thumb: Keep your URLs short and simple and include your target keyword. If your URL structure so far included categories and/or dates, it might be best to leave these out in the future to keep your URLs short and simple. Keep in mind: If your pages already receive a good amount of traffic, it might be best to not temper with your URLs too much. Other websites or blogs might already link to the existing URL and people might have saved it in their bookmarks. If you do decide to change the URL, make sure to implement a redirect from the old to the new URL. Now, it’s important that your target keyword appears in your content, of course. Especially in the first 100 words. So make sure that your focus keyword is used in the beginning of your content. Don’t overdo it, though! While in the past it might have been good practice to use your focus keyword as often as possible to get your page ranking for that keyword, nowadays Google will actually punish you if you do “keyword stuffing”. Google’s algorithm gets better and more intelligent with every update. Google knows which keywords are related and form a topic group. Check out this blog post on Moz which shows some interesting examples regarding Google’s capabilities to understand search queries. So instead of stuffing your content with the same keyword, write good and extensive content while using LSI (Latent Semantic Indexing) Keywords that fit your content. Latent Semantic Indexing (LSI) Keywords are keywords that are commonly found alongside each other. For example, if your page is about the best camping spots in your area, then words like travel, hiking, backpacking or camping equipment are your LSI Keywords. Use these in your content! Most of the times, words like these will come naturally when you write about a certain topic, but at the same time some important ones might be easy to miss. So make sure to do proper keyword research! Next up are your header tags. You want to make sure that your target keyword and synonyms or related words appear in your header tags. WordPress automatically wraps your page’s titles in a H1 tag, so make sure to actually include your keyword there. While the H1 tag of course is the most important one, you might also want to consider putting your keyword in your H2 or H3 subheadings. Don’t go overboard here, though. Subheading appear to not be as important as your main heading when it comes to rankings, and you might also run into the keyword-stuffing problem when you include your keyword in your subheadings. As a rule of thumb, include your keyword maybe once or twice in your subheadings, but mostly use subheadings that actually fit your content. 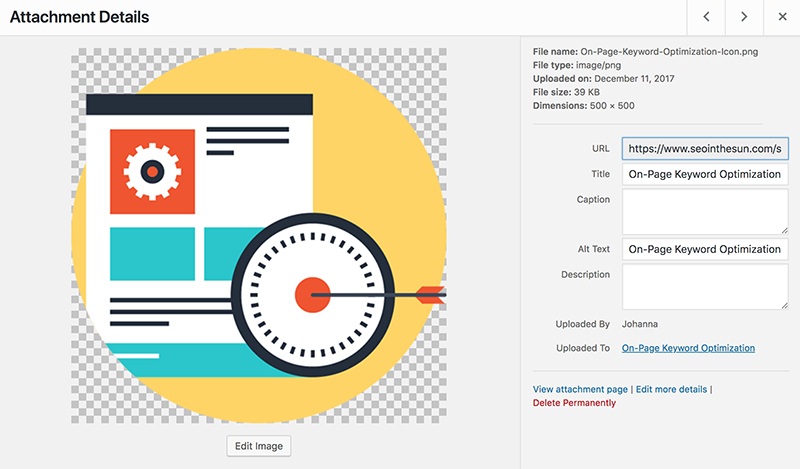 The last step is a quick and simple one: Make sure that the alt tag of your images contain your target keyword(s). For one thing, it is a good idea to have alt tags on your images because screen readers for visually impaired users will read this text instead of the image. But alt tags will also tell Google what’s on an image and gives context to the surrounding text. So that’s it. These are the aspects that you have to keep in mind when optimizing your pages for your target keywords. In a broader sense, there are of course much more on-page optimization aspects which are not directly related to keywords, such as featuring prominent social sharing buttons, making use of multimedia, or making sure to add internal links where possible. Always keep these aspects in mind as well. Now it’s your turn. Dig up your old posts and pages and optimize them for your keywords! Don’t have the time (or the motivation) to optimize your pages yourself? Feel free to take a look at our On-Page Keyword Optimization Service, in which you simply name us your ten most interesting or most important pages and we will optimize these pages for you – in just 2 working days! With Yoast set up and configured correctly, you can use the tool to make your content Google friendly. Do you have many articles to update? With this service, we optimization 10 of your pages/posts with their focus keywords. You choose, we optimize.